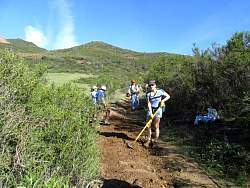 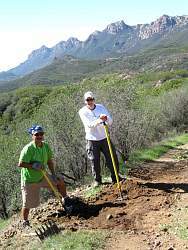 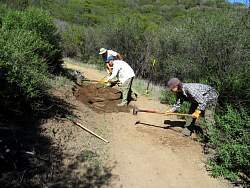 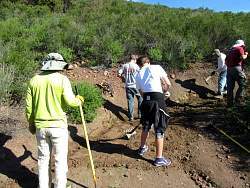 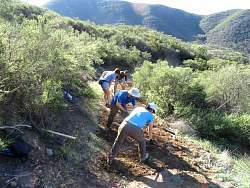 You can read about this trailwork day in our blog. 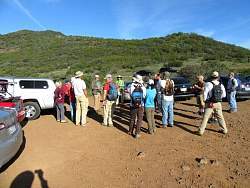 Gathering to hear about the plan for the day, and to learn how to use the tools safely and effectively. 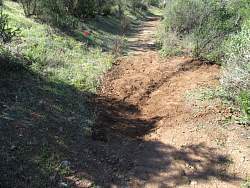 Most of the effort went into fixing ruts and digging drainages to keep them from getting worse, or from forming in the first place. 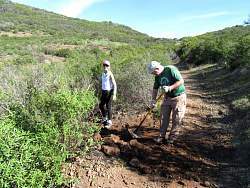 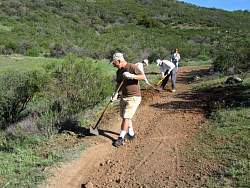 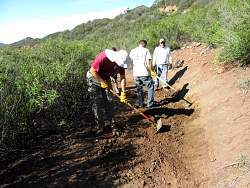 We start by scraping off the vegetation so it doesn't get pulled onto the trail. 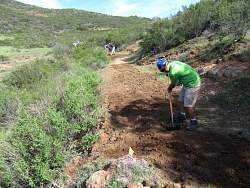 After scraping off the vegeation, the outside of the trail is pulled back to fill in the rut, and to give it a slight slope so water will run off it, rather than down it. 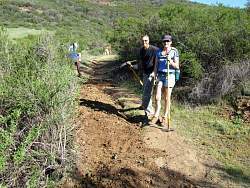 This is called 'outsloping' the trail. 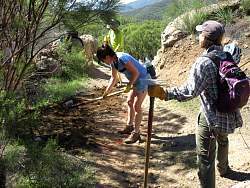 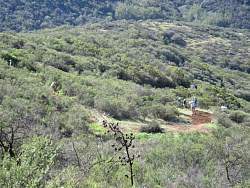 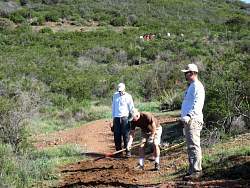 We had nine people working to outslope a couple hundred feet of trail. 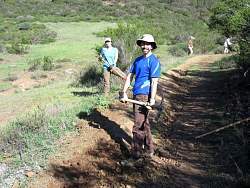 It's a big job! 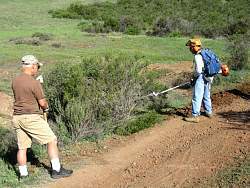 A gas-powered hedge trimmer is used to cut back the light brush at the edge of the trail. 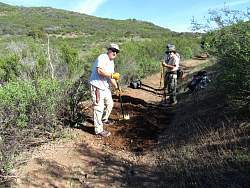 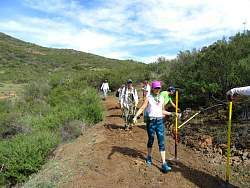 This group is working to build a drainage to divert water off the trail so it doesn't form a rut down the middle. 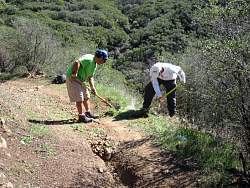 Most people were working to build or clean out drainages. 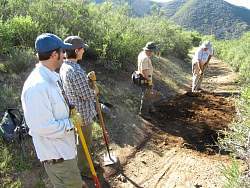 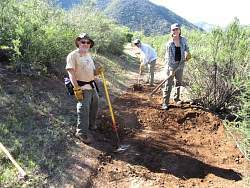 This group was working to restore a drainage at a switchback, and to fix the rut through the middle of it. 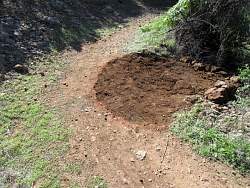 Another finished drainage, but not a nick. 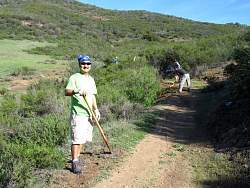 Everybody is happy to be out on such a beautiful day to help repair the trail! 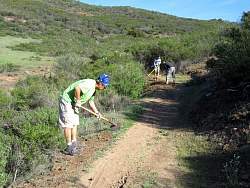 Back where the trail is being outsloped, a lot of progress has been made! 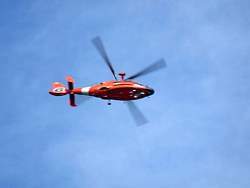 This colorful bird flew by as we were working. 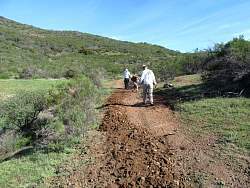 Moving on to work on another section of the trail. 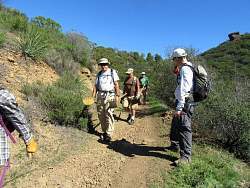 Sandstone Peak makes a great backdrop! 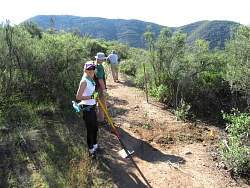 At the end of the workday, heading back to the cars with all (hopefully!) 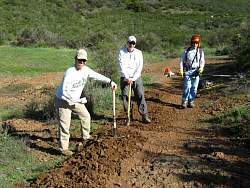 our tools. 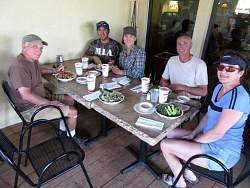 Some of us got together for lunch afterwards at Stonefire Grill in Westlake.